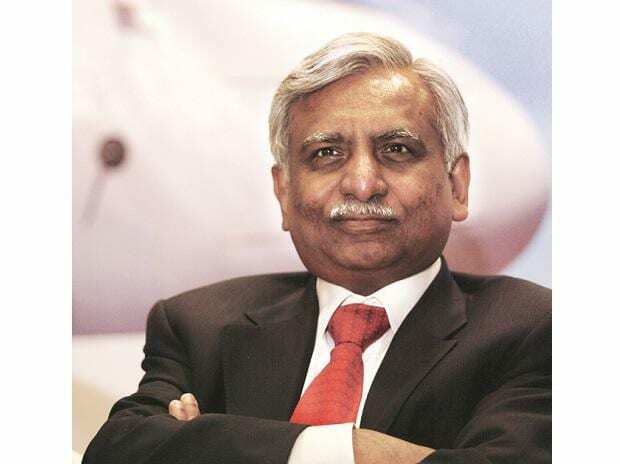 Naresh Goyal’s reign at Jet Airways, the company he founded 25 years ago, ended on Monday as he stepped down as chairman of the board and transferred control to the lenders. The consortium of lenders, led by the State Bank of India, will now own a 50 per cent stake in the airline, while Goyal’s stake would be halved to 25.5 per cent. Abu Dhabi-based Etihad Airways would shed its shareholding to 12 per cent from 24 per cent earlier. 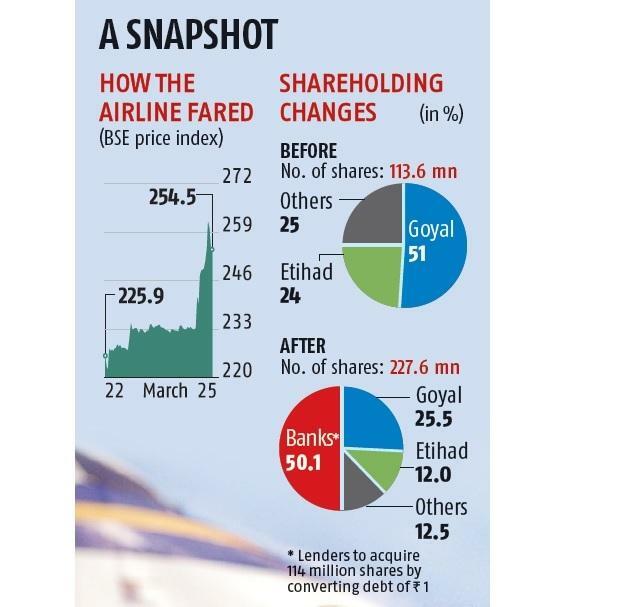 The Jet board on Monday decided to allot 114 million shares to the lenders upon conversion of one rupee of its outstanding Rs 8,000-odd-crore debt and accepted the resignation of Goyal, his wife Anita and Etihad representative Kevin Knight. While former bureaucrat Ashok Chawla, who’s an independent director at Jet, chaired the board as an interim arrangement, Goyal joined the meeting through a video-conference from London, sources said. It was also decided that lenders would provide Rs 1,500 crore in emergency funding to the airline and would invite an expression of interest to find a new investor on April 9. While Goyal has signed a binding agreement with the lenders to reduce his shareholding to below 10 per cent once a new investor comes in, he’s free to participate in the bid process. The banks hope to conclude the deal by the end of May. A new chairman, possibly a banker, will be announced soon till a new investor takes charge, according to a person close to the development. But on Monday, some reports also said Air India Chairman Ashwani Lohani was in race to head Jet in the interim. An interim management committee has been created to manage and monitor daily operations and cash flow, the airline said in a stock exchange notification. Goyal, who began as a cashier in his uncle’s travel agency, had launched Jet in 1993. The airline managed to control the domestic skies for a good part of the last two decades till its dominance was challenged by low-cost peers. Saddled with high debt and mounting losses, the airline defaulted on debt repayments leading to the resolution plan and eventual takeover by banks. Banks will have two nominees on the Jet board, but their names were not disclosed on Monday. While Goyal and his wife have stepped down from the board, he continues to have two nominees on board — Nasim Zaidi and whole-time director Gaurang Shetty. Etihad, which is expected to conclusively take a call on exit from Jet in a board meeting end of this month, has retained a board seat. Etihad has been reluctant to commit more funds to Jet given its own financial problems and its differences with Goyal. That led the banks to rework the rescue plan for Jet. In a statement on Monday Etihad said it continues to work closely with lenders, Jet management and stakeholders to facilitate a solution for Jet. Jet will issue 10-year fully-secured non-convertible debentures to banks and Rs 1,500 crore raised through that route will be used to pay employee salaries and pending vendor dues. Jet has also disclosed that banks will create appropriate security over company’s assets. For the airline, immediate funding is critical as lessors have grounded a third of its fleet crippling operations. Pilots, too, have warned they would stop flying from April 1 if no resolution was achieved by the end of this month. Of total debt of Rs 8,000 crore, about Rs 6,000 crore is the exposure of domestic lenders. The balance is with external financiers — HSBC and Mashreq Bank. They will also be given choice to participate in what domestic lenders are doing. There is possibility that they going to court, the public sector bank executive said. “Goyal’s exit is on expected lines. The next steps are more critical and this includes the amount of equity infusion and quality of new board. It is critical to have a world-class board led by a chairman with proven credentials. Key strategic decisions are required now,” said Kapil Kaul, South Asia CEO of aviation consultancy CAPA.